Congrats, SKye!! We are so proud of you and all of your hard work. This has been a loooooong time in the works. I am thrilled for you and what a difference it will make for your family. So, basically, I've seen about 100 movies since I last blogged about a "must see" movie ("Partition"). 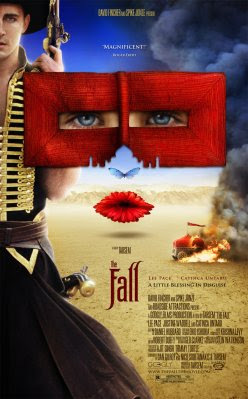 And it's time to blog again, I'm not sure what it is about certain movies, probably everyone has their own taste, but this movie: "The Fall" is one of those for me. This one rates at a 4.7 stars for me (a movie has to be pretty dang perfect to get 5 stars), but this is definitely my personal favorite over the last two years (yes, Matrix, the original, still holds my number one 5.0 spot, all movies I compare against that). Anyway, this movie is rated 'R' because there are images of a few swords going through people, but this one is one that I would let my children see (does that make me a bad parent?) --I watched Rambo when I was about 8 years old (I was 7, 8, or 9, one of those, but the movie came out in '82--wow, I managed to never get a Rambo knife and shred anyone that crossed my path)... but I digress... This movie is very touching, but the cinematography of movies is still something that just amazes me every time I see a movie that makes my visual senses just get overloaded, and make my brain go: "WOW". This is one of those for me. So, rent it or buy it, you really can't go wrong, "The Fall", it is a very powerful movie. Against them while they stand so. I figure that the degree of difficulty in combining two lives ranks somewhere between rerouting a hurricane and finding a parking place in downtown Manhattan. ~Claire Cloninger, "When the Glass Slipper Doesn't Fit and the Silver Spoon is in Someone Else's Mouth"
Either about God's secrets or one's wife. He still is largely celibate.